Rannoch Walk, Corrour Station, Rannoch Moor, Glasgow. Corrour Station is a lonely spot, sitting on the edge of the remote, untamed wilderness of Rannoch Moor. There's a house and an old station but little more. The railway station, sitting at 1,350 feet, is the highest in the British Isles. There is no road in or out and the West Highland Line, one of Europe's most scenic rail journeys, is the only link with the outside world. Corrour Station is the starting point for this walk over the historic Road to the Isles where you can experience the unique allure of Rannoch Moor for yourself. A good track heads east from the single platform across open moorland and, as you leave the security of the station behind, you quickly become aware of the remoteness of it all. The story goes that when the railway line was built criminals fleeing justice in Glasgow escaped by train and hid out on the moor. Unfortunately they didn't reckon on the wild country dishing out a more severe sentence and the police sent up to retrieve them often found only corpses. There is no doubt Rannoch Moor is a harsh environment if you hit it on a bad day. But, in the right light and the right weather, it's a place of great beauty. It is enchanting - so vast and open that you can spend a whole day discovering it and not meet another soul. 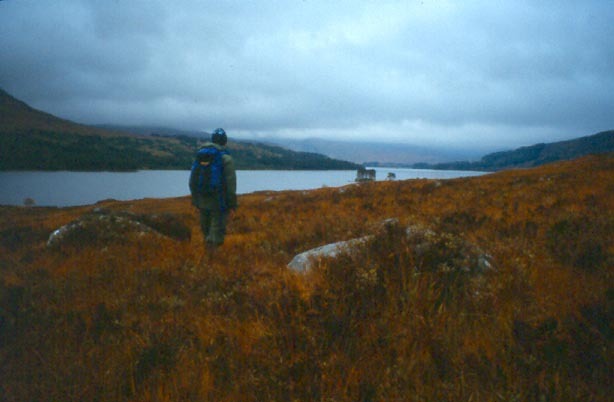 Picturesque Loch Ossian soon looms into view and the track drops down to the west end of the water, dotted with small tree-covered islands. The wooden youth hostel occupies a jutting peninsula and is a popular base for people exploring the surrounding countryside where there are many fine hills. It was, many years ago, boat shed, housing the craft which ferried rich visitors up the loch to Corrour Lodge. The main track meets the path down to the hostel and on the right here is a route signed for Rannoch. Of two branches, take the one which rises left over heather and grass covered hillside. The path skirts round Meall na Lice, a craggy lump rising from the bog, and, in due course, turns south at a memorial plaque. Although the route is obvious throughout, it can be obscured in winter by heavy snow, making route finding difficult and walking hard work. On the next stretch, views open out and the enormous scale of Rannoch Moor comes sharply into focus. It's a huge spongy plain of brown spiky grass and heather, sprinkled with lichen and moss-encrusted boulders. Stick to the path as the water-logged moor is rumoured to swallow people whole! The path undulates a little before falling to the grey stone ruin of the old Corrour Lodge. This extensive structure was Scotland's highest shooting lodge in its day but was replaced by a new, more accessible lodge at the north end of Loch Ossian after the railway opened in 1894. For a time after that it saw service as an isolation hospital. From the ruin, the track climbs again and is wet underfoot. But conditions improve as the way skirts below the south ridge of Carn Dearg, a Munro at 946 metres high. Soon you are descending towards the Allt Eigheach, Rannoch Station wrapped in a blanket of trees visible in the distance. The path meets the river and follows it before crossing a footbridge. A good track leads from here to the public road. The large loch seen over to the south west is Loch Laidon and, beyond, the mountains of Glencoe. The track meets the B846 and a short tramp returns you to Rannoch Station. Maps OS Landranger 1:50,000 sheets 41 and 42. Start Corrour Station (grid ref NN 356664). Parking If you're travelling by car, park at Rannoch Station and take the train north one stop to Corrour Station. Grading A long walk over rough and remote terrain where conditions can be harsh in bad weather.